First up on the panel was Scott Brown, a graduate student in anthropology at the New School for Social Research in NYC. His talk, "Shifting Gears: Cycling Toward an Anthropology of Design," dealt with bike infrastructure design, and was based on his work with Parsons' UrbanBike program. Then Lusi Morhayim, an architect working on a PhD at UC Berkeley, gave a talk on "Car-Free Street Events: From Counter-Public Opinions to Counter-Spaces." She has done participant-observation at Critical Mass, Sunday Streets, and Park(ing) Day in San Francisco, and had an eloquent take on how these events affect participants' ideas about public space. From the University of Memphis came a paper entitled "'It Will be a Super-Highway for Drugs and Crime! ': Neighborhood Perceptions of Greenlines, 'Urban Danger,' and Transportation Alternatives in Memphis, TN." I learned that the University of Memphis has a strong applied anthropology program where people can get MAs while carrying out community-based projects. In this case, Dr. Keri Brondo led a research team that partnered with Matt Farr, who works for the Shelby Farms Park Conservancy, to bolster public support for the Shelby Farms Greenline, which converted an old rail right of way into a multi-use path. Matt read the paper, and has also started a website, Bikes Mean Business, that promotes biking by showing its benefits for local economies. Their paper argued that bicycling has a lot of potential to improve health in Memphis, but people see it as a vehicle for crime. This rang true for me; my experience listening to homeowners in Long Beach reject a bike lane while using euphemistic language about people of color and the poor was what first got me thinking about bikes and anthropology back in 2008, so I was glad to hear the Memphis group's research on this topic. Next I presented my paper, "Diverse City: Situationism, Anthropology, and DIY Bike Infrastructure in Los Angeles." My talk focused on the tendency among bike folks to think about infrastructure in terms of concrete, physical changes to built environments instead of thinking about experimental, human infrastructures. Drawing on the legacy of situationist "happenings," I framed ciclovías as an example of how you can create a temporary zone where biking is less harrowing, and how this could impact what people feel is possible the next day when the streets are full of traffic again. During the talk I showed a continuous playlist of videos people had posted to Youtube of their day at 10-10-10, the first CicLAvia. After me came Nathalie Boucher, a PhD student at Montréal's Institut national de la recherche scientifique - Centre Urbanisation Culture Société. She read "Going Down to the Place of Three Shadows: Journeys to and from Downtown Los Angeles Public Spaces," a paper about her ethnographic research in different parks in downtown LA, and her experience spending the day with a wheelchair-bound homeless man. Our discussant was Zack Furness, a cultural studies professor, author of One Less Car: Bicycling and the Politics of Automobility, and someone with a damn cool website. Since Zack couldn't make it to the conference, he sent us written comments on our papers, and I read them at the end. Though I spent most of my recent trip to Montreal inside conference rooms listening to talks or inside bars carousing with other anthropologists, I managed to escape into the city for some drifting on a few afternoons. This was my soundtrack. I saw lots of transport cyclists, people getting around on bikes without wearing sporty spandex outfits. I didn't see many people riding bikes on sidewalks, and didn't notice any altercations between bicyclists and drivers. The Bixi bike rental system appeared to have pulled most of their fleet out of service for the winter, but I could see that there were lots of convenient places to pick up or leave bikes. Many intersections lacked pedestrian crossing signals, maybe because people just crossed the street as soon as possible, like in New York. I came across a lot of sidewalks that had been closed by construction. In these cases people just walked in the road until the sidewalk cleared. Drivers cut very close to me and other pedestrians in crosswalks. I would have liked to ride the subway more, but the hotel where I stayed in the Plateau neighborhood sat on a convenient bus line. The city has many neat public spaces, both indoors and out. There were lots of juxtapositions in the landscape, old next to new and wintry branches framing modern monoliths. I spent a very pleasant afternoon exploring Quays of the Old Port of Montreal, Montréal's frontage along the St. Lawrence River that has been converted into a series of public spaces. J'aime bien l'adaptive reuse. I really enjoyed Montréal's bilingual culture, and it made me realize how little I know about the French colonial legacy in North America, the Hudson's Bay Company, and the politics of language. Where I grew up in Southern California, Spanish might be heard as often as English, but due to racism I can't imagine it becoming an official language. Hope I have an excuse to visit Montréal again soon. The concept of "habitus" allows social theorists to talk about the connections between seemingly insignificant actions we take every day and our perspectives on what should happen in the world around us. In my graduate research, I've used it a lot to think about why biking in cities like LA is possible for some people, but seems totally crazy to others. My favorite theorist, Pierre Bourdieu, wrote a lot about habitus, building on the work of another French anthropologist, Marcel Mauss. In the 1935 essay "Techniques of the Body," Mauss characterized the body as our primary tool for experiencing the world, focusing on the importance bodily practices can have in our worldviews. The things we do over and over in our everyday lives have a lot to do with what we think we should be doing. I usually decide to take the train instead of flying to academic conferences because riding the train allows me to use a less ecologically destructive mode of transport and it exposes me to people I would not encounter in my life at home. I've created an Amtrak habitus for myself that allows me to stay comfortable while hanging out with strangers for days at a time. When I take a long trip, I bring lavender castile soap and a little French press. Brewing my own strong coffee and washing up with a pleasant scent make me feel at home on the train. Through my routine, I inhabit a familiar place while in motion. Riding long-distance trains still makes me seem like an eccentric, I guess, but it sure makes me wonder how other people get to know this enormous country. I just got home from a trip to Montreal for the American Anthropological Association conference. My itinerary took me on the Empire Builder, Lake Shore Limited, and Adirondack trains. Some seatmates stuck out in my mind. One lady happened to have been an extra in Breaking Away, a go-to movie for bike-themed outdoor film screenings, when she was working on her anthropology PhD in Bloomington, IN. She had long ago decided against an academic career, and instead worked in museums. Another seatmate told me that she regretted raising her kids speaking only English. An Egyptian by birth, she spoke Arabic, French, Italian, and English when she married a Mexican American man who did not want his children to be multilingual. My last seatmate wrung my heart the hardest. A Navajo railroad repairman, he laughed at my jokes and showed me a video of his horse ranch. We chatted about Chinle and other Navajo places. Then he asked me for advice about his girlfriend, who was carrying their baby, and who had been posting on Facebook about late night carousing. He said that sometimes she slept and slept, and once when they'd kissed he'd been stung by something very bitter on her mouth. Moving around the train breaks up long journeys and gives me an escape when seatmates get overwhelming. Usually I spend a day in the observation lounge. On this trip I had a morning chat with a young black woman on her way to see her boyfriend in a North Dakota oil town. She told me earnestly about her hopes for the baby she was carrying. After she reached her destination and took her bright smile off the train, I settled down to work on a dissertation chapter. The lounge soon filled with the loud hijinks of a few white men intent on a spree. Since alcohol is sold on board trains, some people think of the trip as one long binge, and it's not uncommon for Amtrak to kick drunks off the train. These guys sipped on Black Velvet and beer and got rougher and rougher, and I started hearing jokes using the n-word. I took off my headphones, my heart pounding, wondering what I should do. Sitting there without saying anything made me feel like I was somehow complicit in their ugly repartee, not to mention unsafe as a person of color. Once they taunted a black conductor who passed through just after a fried chicken joke, I decided to do something. I caught the laughing eye of one man and said that they couldn't use such inappropriate language in a public place, that it was unacceptable and they should keep it to themselves. He immediately backed down, but his buddy, the wildest of the bunch, told me to go sit with the kids. "This is the booze car," he said. A woman moved to the seat next to me and thanked me for saying something. We sat there for about an hour, each doing our own thing, while the same group continued with their banter but without the racist jokes. Later on I decided to tell a conductor what I'd heard. He let me know that they'd be escorting that passenger off the train at the next station. I wasn't the only person who'd been made uncomfortable, it turned out. When I interrupt racist banter in the lounge car, I'm making a statement about what is ok on the train. Because I was there I could assert that this train was not a segregated space that tolerated hate speech. My Amtrak habitus has shown me how many different kinds of people ride the train. As a theorist and as an activist, I know that interacting with people unlike ourselves can have a positive impact on the world we live in. Riding the train brings one into a cosmopolitan space, which unfortunately might be a novelty for many Americans. I'm glad I've been able to make it my routine. I recently finished Bike Works' Adult Basics Class (ABC), where I'd been spending my Sundays for the last six weeks learning about basic bike repair. The teacher, stylin' bike advocate, comic book artist, and all around wonderdude Davey Oil, had started us out with some basics not about bike repair, but about the social dynamics of bike repair. He encouraged us to think about how the bike world does not necessarily interrupt the race/class/gender discrimination many people experience in their everyday lives. So, fittingly, he wrapped up the class by asking us to use our new bike knowledge to help people, not to bludgeon them with our insider status. To me, Davey's observations were spot on. I've avoided learning much about bike repair even though I've been an urban transport cyclist since 2005. A big reason was having a partner who enjoyed learning about sprockets (guess who got the bike pump when we split up), but I also felt out of place in bike co-ops and other spaces where some people knew a lot more about how these machines functioned than I did. I tend to feel intimidated by my own ignorance, and it can get in the way of me learning new things. When I lived at the LA Eco-Village, even with the fabulous Bicycle Kitchen a few blocks away and many cooks as my neighbors, I didn't blossom into bike repair glory. I did spend a few hours at the Bike Kitchen on a Saturday back in 2010, learning some bike maintenance basics. The thing that stuck with me, though, wasn't how to hang a bike on a repair stand, but that my front brake freaked bike mechanics out. Back in 2007, when I still lived in Portland, I came out of a shop on SE Hawthorne one afternoon, and discovered, as I tried to ride home, that my handlebars had a new shape and that the front wheel would turn only under duress. Baffled, I eventually decided that someone had attacked my bike with a blunt object. I took it in to the Bike Gallery on SE Woodstock, and they installed new handlebars. The mechanic there explained that though one of the front brake's caliper arms had been bent, it still worked just fine, so he wasn't going to replace it. 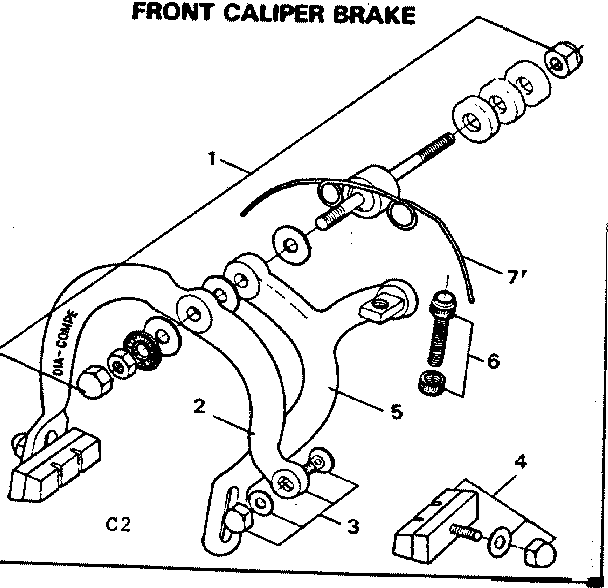 So I rode around for years, not having any problems with my brakes. I knew that my front brake looked funny, but usually I forgot about it until a look of horror crossed the face of the person-in-the-know examining my bike. Especially once I started doing outreach with day laborer cyclists, some of whom managed to get around on bikes with much bigger problems, I saw my front brake as a symbol of biking unpretentiously. Then, on the first rainy day I rode in Seattle this October, I discovered that my brake was all wonky. Living in a rainy, hilly city has made me more concerned about bike repair than I ever was in Portland or LA. When I asked Davey to take a look at it, his face reminded me about the bent caliper arm. It turned out to be the quick release mechanism messing things up this time around, but on the last day of ABC, when we got to bring in our own bikes instead of learning on the kiddie bikes that Bike Works refurbishes, I knew what my project would be. Time for a new brake! In order to get the job done that same day with the shop's limited supplies, I ended up replacing my front brake with a simpler one that did not have a quick release for easy wheel removal. I gotta say, I felt pretty good about doing this thing myself. I even figured out that I could strip the replacement brake down to its centerbolt so that I could transfer everything onto the longer centerbolt that had attached the old brake to my bike. I've got many more overhauls in mind for my bike, now that I feel more comfortable digging in and figuring this stuff out. If you find yourself learning about bike repair and feeling embarrassed, make sure you're in an environment that doesn't take itself too seriously. Davey really drilled us to accept that it's ok to not know what you're doing, and I also once spent a magical afternoon at the Bike Kitchen fixing a flat under the mad tutelage of cooks Eric Potter and Jonny Green, which showed me how fun bike repair can be with the right attitude. I mean, it was like Alice in Wonderland meets Mary Poppins up in there. Thrills galore! I like to get a little fieldwork in when I travel. My trip to Salt Lake City culminated in one incredibly busy day, where I presented on a panel entitled "Transportation Mode Choice and Behavior among Immigrants" at the Association of Collegiate Schools of Planning annual conference, and also visited a local bike organization that does cool work. This was my first time at ACSP, and I really enjoyed it. I ran into folks from my university, fell in with a flock of Canadian planning PhDs, and generally had fun. 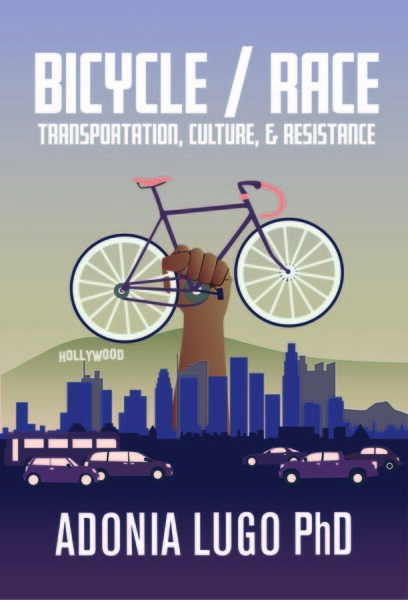 By going to panels, I also got a better sense of what I'd need to say to make my research about bikes, bodies, and public space in LA mean something to transportation planners. After listening to a rewarding roundtable discussion by recipients of the Paul Davidoff Book Award, I scooted out to the light rail and used the transit pass that had been included in my conference materials (what a great idea) to head south to the SLC Bicycle Collective. I was interested in visiting because their website talks about recycled bikes and serving low income communities. My research and activism focus on making connections between low income communities and the bike movement. Not only do low income cyclists exist in cities and suburbs, we should be doing more to promote cycling in low income communities. So I was excited to find out what's being done on this front in SLC! Located in a light industrial neighborhood, several long blocks from a light rail station, the Collective has an impressive workspace full of bikey materials. When I arrived, there were only a few people wrenching, since they had not yet started their public hours. Over coffee at the vegan café down the block, I met with Jonathan Morrison, a co-founder of the space and the executive director, and learned a bit about their goals and programming. Jonathan moved to the city in 2000, and met some other bicyclists through Critical Mass. Someone at a local government bike advisory committee suggested opening a tool cooperative, but the city passed on funding something like that. Thinking it'd be cool to have a place to fix their bikes, a kind of shared garage, a group of people decided to take the project on. They incorporated in 2002, and decided to focus on offering bike education to low income kids and promoting bikes as transportation. Almost ten years later, they're going strong. Most impressive to me, the Collective has relationships with groups that support refugees and other immigrants in Salt Lake City. A person in need of transportation can get a voucher from a participating organization, bring it here, and walk out with a recycled bike. I like the idea of nonprofits working together like a machine. And, similar to what happened in Los Angeles around the Bike Kitchen, the Collective's presence seems to have encouraged more businesses to open up in the neighborhood. The vegan café (where the very sweet server treated us to coffee) and another bike shop have opened up nearby since they settled into this location. When we walked back over so Jonathan could open up the space for fixing hours, we found a group of people waiting to get to work. Before I left I happened upon a volunteer trying to communicate with a Latino man who spoke mainly in Spanish. Jonathan had mentioned that the collective hasn't yet managed to establish relationships with SLC's Latino community, and it did seem like this man was having a hard time getting started on his repairs. I tried to help facilitate understanding, but having gone months without talking about bikes in Spanish, I struggled too. Fortunately it seems like a space that would welcome more involvement by Spanish speaking volunteers, and I admired the effort the volunteer made to cross the language barrier. As I walked back to the light rail, I thought about how if I lived in SLC, I would be volunteering at the Collective and helping bridge that gap, being human infrastructure to make their services work for Spanish speakers. Then I thought, how come I'm not doing that work in Seattle? Thanks for reminding me to take initiative in my community, SLC Bicycle Collective! 1. Here industry does not refer to pollution or exploitation. It refers to group harmony. 2. The streets are very wide. My hostess told me an urban legend about the streets being made wide enough to accommodate wagons turning around. The city's grid centers on the LDS temple. 3. Because religion shaped the urban form, public and private space can be hard to differentiate. What look like city parks or shopping malls are actually church properties. 4. At one such park, the LDS church "honors" Brigham Young as a colonizer. They gloss over his polygamy though. 5. The sturdy old buildings remind me of other southwestern cities like Flagstaff and Denver. 6. Across the railroad tracks on the west side of downtown, you can find some industrial urban decay. 7. The City and County building looks like a fantastic castle. It's the grandest example of Richardsonian Romanesque architecture I've met. The security guard inside let me wander around after giving me a mini lecture about the building's history (this dude was well informed). 8. They've got the most picturesque capitol I've seen, up on a hill commanding the valley. The interiors were very impressive, but it all felt too clean and neat rather than maturely aged. 9. The City Library blows my mind! Rooftop garden, check. Lots of seating next to windows, check. They also have shops inside an atrium, a very engaging layout, and a fantastic public space outside. Also it's open till 9 pm on weeknights. Last but not least, beekeeping in the rooftop garden. 10. There's a garden called Gilgal that looks kind of like a cross between a miniature golf course and the Watts Towers. Like the Watts Towers, it was developed over many years by one guy. My hostess described it as a different expression of LDS faith than one would find at the tabernacle complex. 11. As I left Gilgal, I saw a woman who was texting and driving very nearly run over a young girl riding a bike in a crosswalk. I don't think the texting motorist ever noticed the girl, she didn't slow down or look up from her phone. The girl had to stop short, about an inch from being hit. I tried to shake the chill from my spine. Later I discovered that the U.S. Department of Transportation has a campaign around distracted driving. Here's their website. Amtrak's California Zephyr line runs from Emeryville near San Francisco to Chicago. It crosses the Sierra Nevada, the deserts of Nevada and Utah, and climbs again over the Rockies. I took it from Sacramento to Salt Lake City, spending a sunny afternoon in the observation lounge watching pines and mountains pass by. I read my book, but I also eavesdropped. A large group of elderly people had boarded with me in Sacramento, apparently part of some paid excursion. My trips on Amtrak's long distance trains have shown me that many of the people with the wealth and leisure time to buy sleeping car accommodations have lived long enough to remember the glory days of passenger rail. This train, though, with its particularly scenic route, seemed to attract even more old folks than usual. My ears caught the occasional murmured remarks of a man traveling alone who seemed to know an awful lot about the terrain through which we traveled. Perhaps he'd worked in some industry here? Though others listened to his words and sometimes asked questions, he never struck up a conversation with anyone, staring out the window as he spoke. Over the intercom a volunteer shared facts about our route, and the quiet man seemed to enjoy naming landmarks before we heard them announced by the official guide. To my left I heard a woman with leathery, oversunned skin strike up a conversation with another woman. Their husbands played peripheral roles in the interaction. She assumed that this woman would share her Republican partisanship, and launched into an enthusiastic overview of her economic and political beliefs, probably culled from the radio pundits to which she claimed allegiance. "We go to the Tea Party," she shared, before claiming that "half the kids at Occupy Wall Street don't know what they're picketing for." Then she and her husband praised their favorite resort in Mexico, down south near "Kawsta" Rica. So cheap! In the same breath, they talked about how they wouldn't go near Ensenada or other towns near the border because of the drug violence. These people did not support "handouts" here, but they did not seem to grasp the exploitation people suffer in Mexico. What would happen to their suburban enclave in the bay area if they got their myopic way, destroyed all social services, and more people turned to lucrative trafficking of illegal goods? Maybe they don't understand that what they experience as affluence, the freedom to ride their motorcycles around the country and to visit all-inclusive resorts in parts of the world they can't pronounce, wouldn't be considered crumbs off the table of the people whose economic interests their twisted politics support. After the talkative couple returned to their seats, I overheard the husband of the accosted woman express his frustration at the tanned woman's presumption. They had voted for Obama. "I thought she was nice," his wife retorted, going back to her seat alone in a huff. The Coast Starlight chugged into Sacramento around 5 am last Tuesday. I picked up my things and went into the station and sat there until the sky lightened, around 7:15 am. Using my handy internet phone, I identified a source for caffeine and set out for Temple Coffee. The café's overhead lamps reflected in the window. As I've remarked before, I really like that layovers on the train happen in the middle of cities rather than in contained non-places like when traveling by air. I needed to be back at the Sacramento train station for an 11 am train to Salt Lake City, but I had a few hours for exploring. Despite having grown up in California (fourth generation, yo! My great great grandfather drove a streetcar in San Bernardino at the turn of the century), I'd never been to the capitol. So I knew my drifting needed to take me there. The morning gloom burned off while I made my way around. I saw some neat buildings and public spaces, and lots of people biking, but also a surprising number of empty storefronts and decay. I found some helpful maps posted around downtown, so I didn't manage to get fully lost. Good thinking, city peeps! Then I found the capitol by following a lovely pedestrianized avenue. I went inside, expecting them to hassle me about carrying a backpack and full tote bag (no lockers at the train station, unfortunately. The only cities where I've been able to use lockers are Chicago and Portland, where you can find lockers in the adjacent Greyhound station). The guards didn't care, so I got to wander around the stately old halls. Pretty much by myself, too. All up in your rotunda. Fancy lamps in a stairwell. I think this was in the midcentury East Annex. Heading back to the train station, I saw a shopping mall. It could be that there are so many empty storefronts cause of this mall in the city center. Personally I'd rather go to a store in a handsome edifice like this one. Lots of lovely California architecture. Getting to the train station, which is part of a regional transit center, isn't exactly pedestrian friendly. First you have to cross a street where they've limited your crossing options. And then the public space in front of the station is filled with parking. I made it back with plenty of time. I could see from the train platform that there was a secret passage to Old Sacramento. Intrigued, I passed through. It's neat that there's a pedestrian connection to the park under a highway, but I felt let down when I got there. I love old buildings, but in a case like this, where the city relocated old buildings to this spit of land between a highway and a river, what you have is a tourist trap and not a thriving neighborhood. My willing suspension of disbelief couldn't overcome the roar of traffic on the highway.